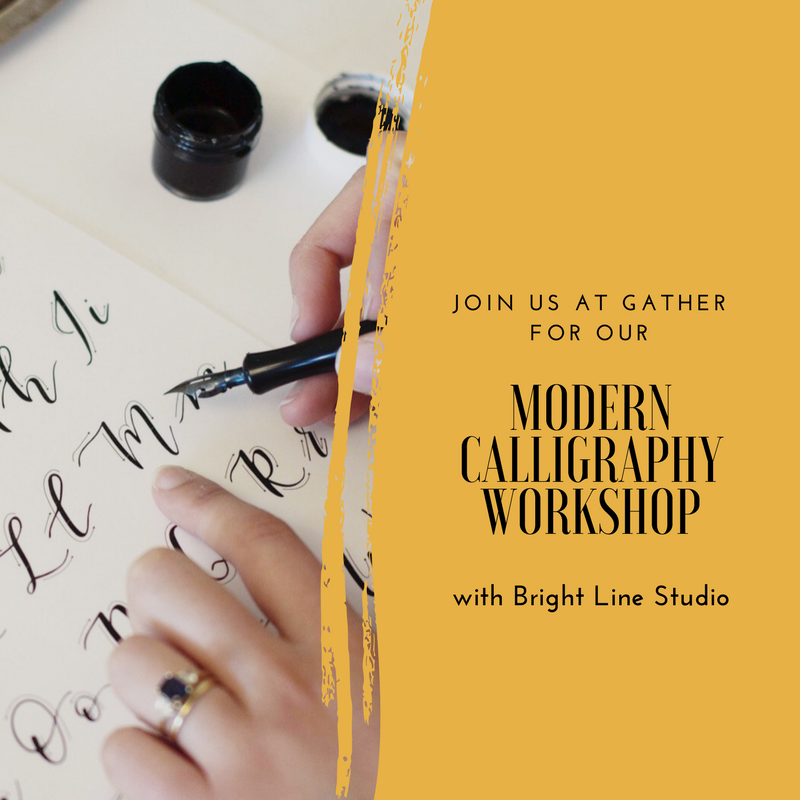 Join us Sunday June 10th at 11a for our new Modern Calligraphy Workshop with Rachel Jacques of Bright Line Studio. This two and a half hour class is for beginners who are eager to learn modern calligraphy! We will go over the basic strokes before heading into the lower case and upper case alphabet. All the necessary materials you need for the class and at home practice will be provided. You will get a complete alphabet and resources workbook for beginners, worksheets, oblique calligraphy pen, 2 nibs, a Rhodia paper pad, black ink, and extra paper. At the end of the class you will create a hand lettered quote that you can take home! Bright Line Studio, is a boutique design and calligraphy studio based in San Francisco. Designer, Rachel, focuses primarily on wedding and event branding, paper goods, and styling. She started calligraphy when she was planning her own wedding. What started as a need for her own wedding quickly turned into her passion and business. For Rachel calligraphy is a way to relax and enjoy creating beautiful keepsakes for myself and others. As always, we'll provide some mimosas and brunch snacks to fuel your creativity. We'll even give you a special discount on gather purchases while you’re there! Be sure to sign soon, spaces will fill up fast. For continued practice at home you can purchase a modern calligraphy kit after the class for an additional $25! The kit includes extra nibs, a straight calligraphy pen (different than in class), a copy of the alphabet workbook, extra practice sheets, and a variety of fun paper and envelopes to send cards and make art pieces. Everything you would need for continued practice or to gift to a artistic friend! 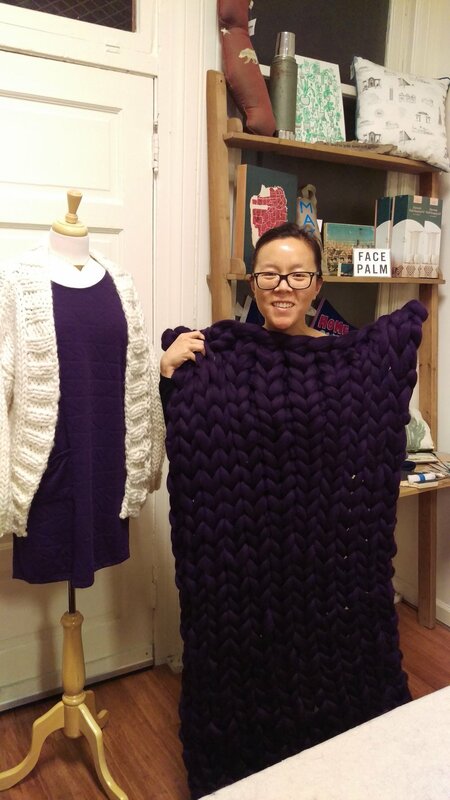 We had such a good time at our Giant Knit Blanket Workshop with Cara Carey Designs last night. The thick merino wool was like a cloud and the colors, so good! It was so fun learning the table knitting technique, how to source the materials, and meeting new faces. Every student was able to finish their blanket in the class too! We had such an overwhelming response to the class we added another on Thursday June 21st at 7p. You can register for that class here. Hurry before it sells out! No knitting experience required. We are looking for a new addition to our team and are now hiring for a part time retail sales associate position. Job description and how to apply are below. We look forward to receiving your application and meeting you! Step 1: Please fill out and submit the application found here. Join us Sunday May 6th at 11a for our new Image Transfer onto Glass Workshop with Chelsea Hiatt Farley of Cuppa Fog. For this workshop she will teach you how to transfer images onto glass! You will go home with 4 glass pieces that can be used as coasters or hung on a wall or in a window. This same technique can be used to transfer images onto mirrors. In this class, Chelsea will teach you: Glass preparation, image transfer application, removal of paper, finishing techniques, sealant method, and how to apply hardware onto the back of your new art. *If you use our provided vintage-themed San Francisco photos the cost is $75, but if you'd like to customize it more you can use your own photos for $90. If you are using your own photos we recommend choosing good contrast and high resolution digital files (minimum of 1MB, please do not pull off of social media sites as they are too compressed). We advise you to stay away from portraits (people or animal), as they are tougher to make sure the distressing doesn’t happen over important parts like faces. Please email pictures to hello@gathersf.com by Tuesday May 2nd. Chelsea Hiatt Farley has made a business of transferring her photos on to wood with her company Cuppa Fog for the past 6 years and her Image Transfer to Wood Workshop is one of our most popular classes at gather. We carry her beautiful San Francisco-themed pieces in the shop. She is constantly inspired taking photos of our beautiful San Francisco and the coast, and loves how the image transfer process brings additional texture and storytelling to her photographs. This two hour class also includes mimosas and snacks and a discount on merchandise in the store that day. No experience needed- all levels welcome! Registration closes at midnight on Wednesday May 2nd for custom pictures ($90) and Saturday May 5th for SF themed option ($75). Register now! Hurry space is limited! Join us at gather on Monday April 30th at 7p as we host Girls' Night In for their monthly book club. Every month, they choose one book to read together as a community and we are so excited to host them in April. We will be reading the National Book Award Finalist "Pachinko" by Min Jin Lee. "In this gorgeous, page-turning saga, four generations of a poor Korean immigrant family fight to control their destiny in 20th-century Japan, exiled from a home they never knew." Gather with other women in San Francisco for a great book discussion, mingling, shopping (a discount on merchandise! ), and light refreshments! We'll start discussing Pachinko around 7:30p and wrap up right around 8:15p. Girls' Night In readers and non-readers are welcome. Anyone who identifies as a woman is welcome. Ticket price includes drinks and snacks. Snag you spot here. The Girls’ Night In brand and community was built on the belief that as our lives get busier, the more important it is to take a break and chill out. With mental health issues rising and rates of loneliness increasing in a society that’s “always on,” we believe that taking a break and cultivating friendships is a crucial part of what wellness means for women, whether that means getting in some “me time” with a good book or rounding up friends for a fun girls’ night in. Did you catch us on the new show This is SF last month? Watch the full clip here! We had such a fun time sharing our shop and talking a bit about our workshops! Take Jennie's block printing class on June 2nd! Join us at gather Thursday April 26th at 7p for our Level 2 Crochet: Round Rug Workshop with Cara Corey. If you've mastered the single crochet stitch and feel ready to move on to other stitches, this is the class for you. Learn to make a cute and sturdy round rug with recycled T-shirt yarn. 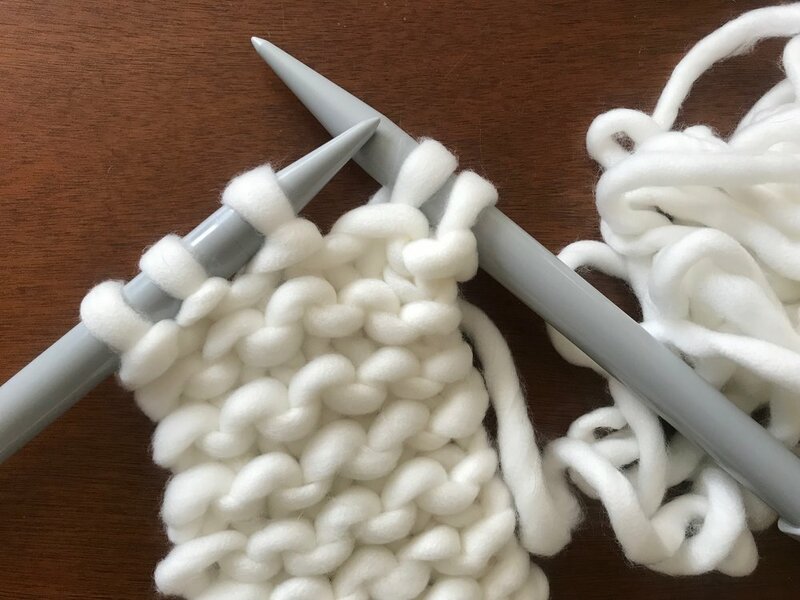 You will master adding height with double crochet and half double crochet stitches, joining stitches to form rounds, and increasing stitches in a pattern to make a flat circle. You will get a good start and possibly finish a round rug, approximately 24 inches in diameter, during the 2 hour class. You can also purchase more yarn to make your rug even larger. Choose from an assortment of colors of yarn when you arrive. Jumbo-sized crochet hook included in the price. Those that have taken our hand crocheted blanket class are perfect candidates for this class (though it is not a pre-requisite...email hello@gathersf.com if you have questions). Class also includes wine and snacks and a discount on merchandise in the store that night. - Sage, Cedar, Sweetgrass, Lavender, Amaranth, Bay Leaves, Eucalyptus, Ginger, Rosemary, Yarrow, Peppermint, Rose, Oregano, and more! In this two hour class, all materials will be provided to make at least two smudge sticks with a curated selection of our ravishing gemstones that you can tie to your wands. Hang your new wild and gorgeous creations on your wall or burn them with love and intention. Sip on wine, enjoy snacks, and shop using a special discount during the class. It will be the perfect night! P. S. Our candle workshop is almost sold out! Snag your spot now or see what other creative class we have on the calendar. Spring has sprung and we are celebrating at gather! We've got a special rack at the shop marked up to 50% off that includes gems like Preloved sweaters, Curator striped tops, and Nooworks favorites. And for this week only we are offering 10% off ALL regularly priced clothing too! That includes new arrivals, and all men's and baby stuff too! That means you can take 10% off this adorable chambray Bridge and Burn top and this cutie from new gather maker Chan + Krys. Can't make it into the shop? Use the code "FLOWERS" at checkout to take 10% off clothing in our online shop. But hurry, this offer expires Saturday night! P. S. There are still a few last minute spots available for Thursday's Embroidery Workshop with Jenny Lemons! Also have you seen all the new classes we have on the calendar? Can't wait for our Botanical Smudge Sticks and our Giant Knit Blanket workshops! The Shops Sale is Back! The Shops Sale is back! Join us Sunday March 11th from noon-4p at Temescal Brewing Company in Oakland as we pop up with a group of other locally owned shops for a super sales shopping experience. Each shop will be bringing a rack of past styles marked at a steep discount. Help us all make room for our new Spring merchandise in our shops and snag beautiful tops, dress, jackets and more for a steal. Men's and women's items will be marked 50-80% off! This bi-annual event is not to be missed! RSVP in Facebook and tell all your friends. What could be better than an afternoon of sales shopping and beer? 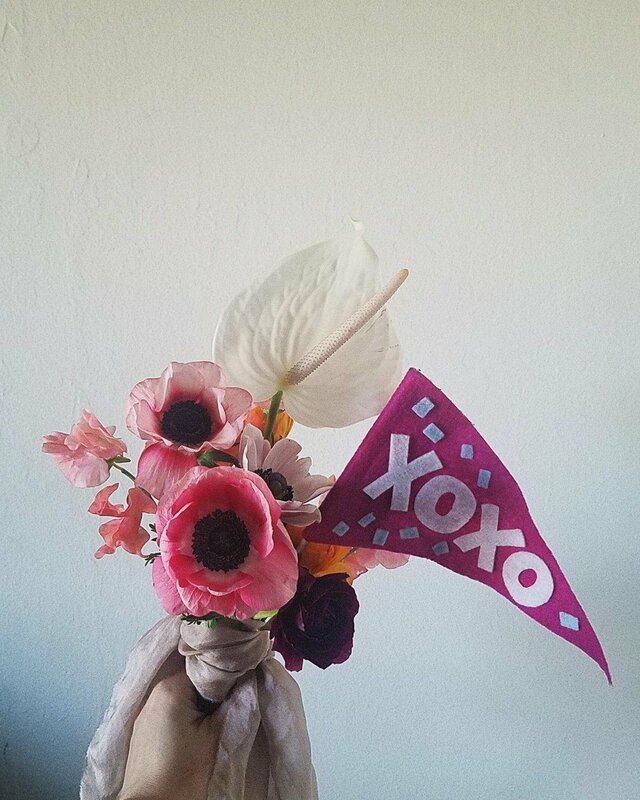 Join us Saturday February 10th and Sunday February 11th from 11a-4p for a special Valentine's Flower and Plant Pop Up with local florist Rust & Flourish. Shop her beautiful floral arrangements, potted plants, hand foraged smudge sticks, crystal succulent gardens, and more. Get your sweetie a gift for Valentine's Day or pre-order a bouquet to pick up at the shop on the 13th. Email hello@gathersf.com for any questions or requests. Join us Saturday December 16th with local florist Ricci Cande of Rust & Flourish who will be popping up at the shop with a special DIY Planting Bar. 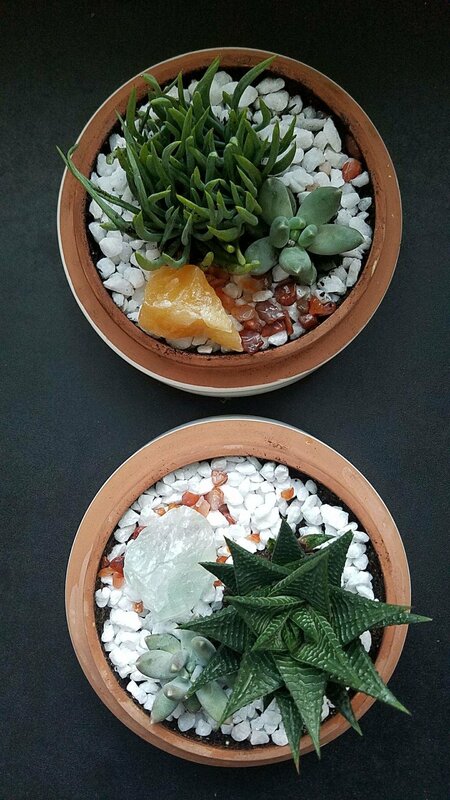 Pick from a variety of vessels, plants, and rocks and crystals to create your one of a kind potted beauty. Prices will range from $15-$30. Make a beautiful holiday gift or bring home some greenery for yourself! Join us Thursday December 14th for a Yule Celebration Tarot Workshop. We will be welcoming Alejandra León Wolfe Rocha, of The Lioness Oracle to teach this magical class. For this class you will need a journal, pen, and Tarot deck. Beginners welcome! This two hour class also includes wine and snacks and a discount on merchandise in the store that night. Shopping for family and friends can be so stressful, but we're here to make it easier for you. We have gifts for every budget, plus stocking stuffers, experiential gifts and gift cards. 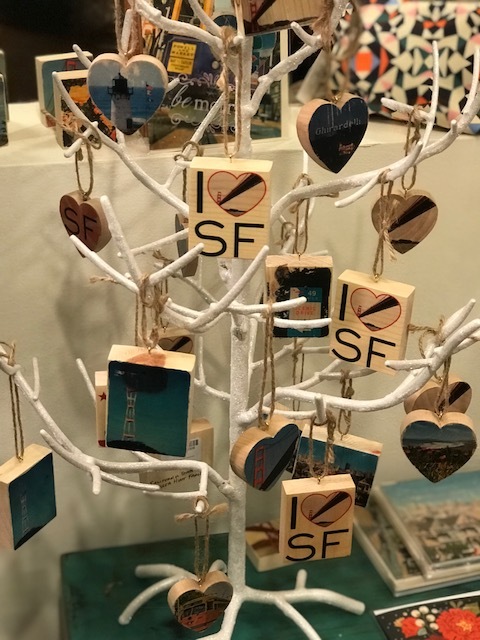 Trim your tree with SF Mercantile's California bear ornament or one of their San Francisco-themed glass ornaments. If you need a jewelry gift, consider our best-selling earrings from Oh, Hello Friend. They're a steal at $18 a pair and come in cute, sometimes cheeky designs like these little pizza slices. New parents will love our clothing items that come as matching sets for adults and kids (like our papa bear, mama bear and little bear tees). Our latest gather x Harumi K collection includes several clothing pairs, including this white V-neck dress for mom with matching toddler dress. If you have a hard time deciding on one gift, let us do the work with one of our themed gift boxes. You will receive 10 percent off everything in the box and we can ship them for you, too. If you know someone who could use a little pampering, treat them to some Herbs + Oils bath soaking crystals ($24) or one of their soothing soy candles ($24 each). We also have several varieties of Etta + Billie handcrafted soaps ($12) and their exfoliating mint coffee scrub ($11). And if you want to fill your home with a holiday scent, we have a fresh stock of vanilla and Christmas tree scented candles ($13) from Lighten Up Shoppe. Complete your gift with a cute card by Paper Raven. We have Christmas, Hanukkah and general holiday greeting designs. Need a stocking stuffer? 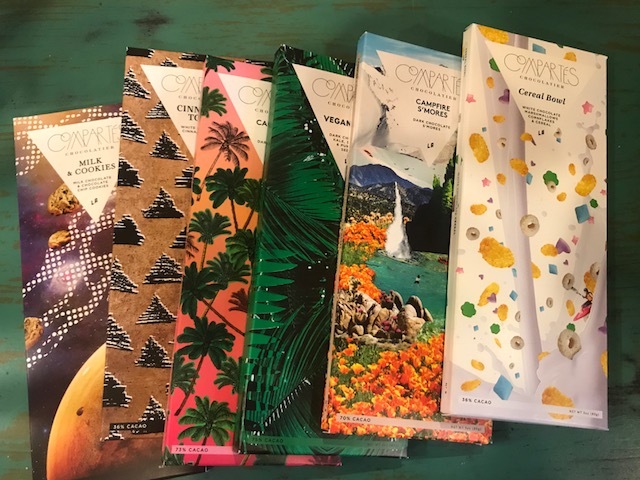 Our Compartes chocolate bars come in a variety of interesting flavors and are boxed and ready to go inside anyone's stocking. Come to the shop to see all the options. Cuppa Fog just brought us lovely petite SF-themed ornaments that make great gifts at only $10 apiece. Can't think of what to get someone? How about gifting one of our workshops? We have several to choose from each month (knitting, candle making and floral arranging are coming up in the New Year). Or you can go with a gift card and let them choose their own gift. We add new items to the shop all the time, so take advantage of our extended holiday hours (11-7 daily!) to check out everything in person. 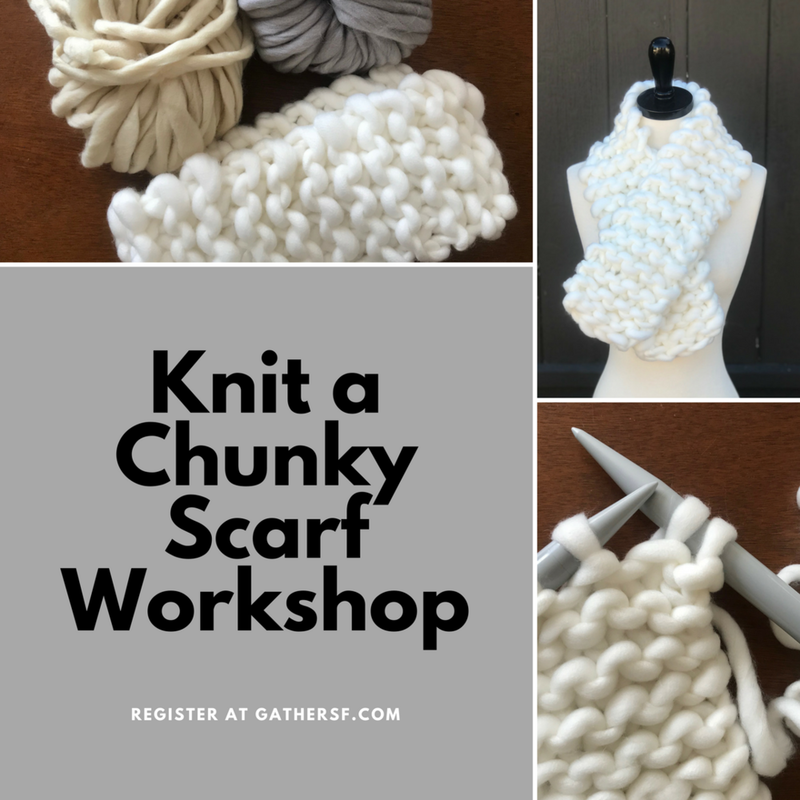 Join us Tuesday December 12th, 2017 at 7p for our new Knit a Chunky Scarf Workshop with Cara Corey of Mary Marie Knits. 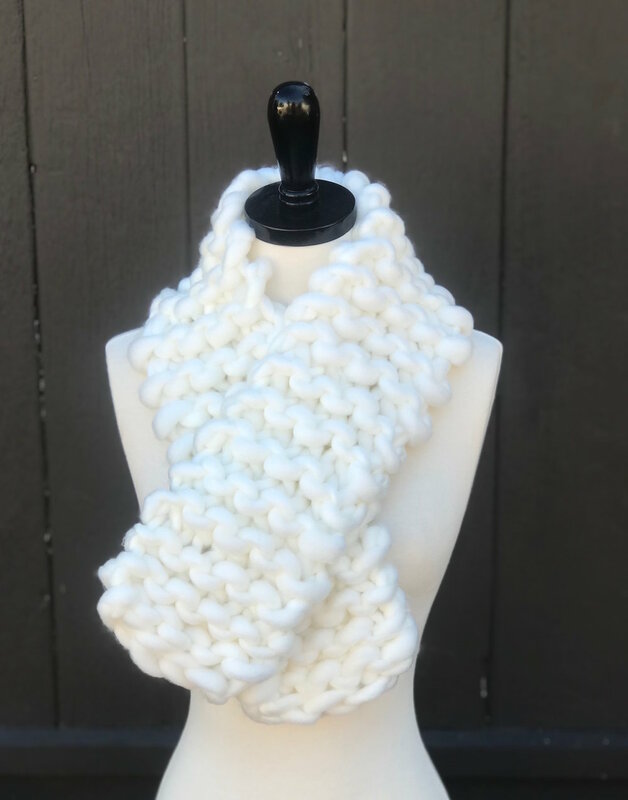 Whether you're new to knitting or you once started a knitting project and never finished, you will love this quick scarf that's perfect for beginners (or a great holiday gift)! 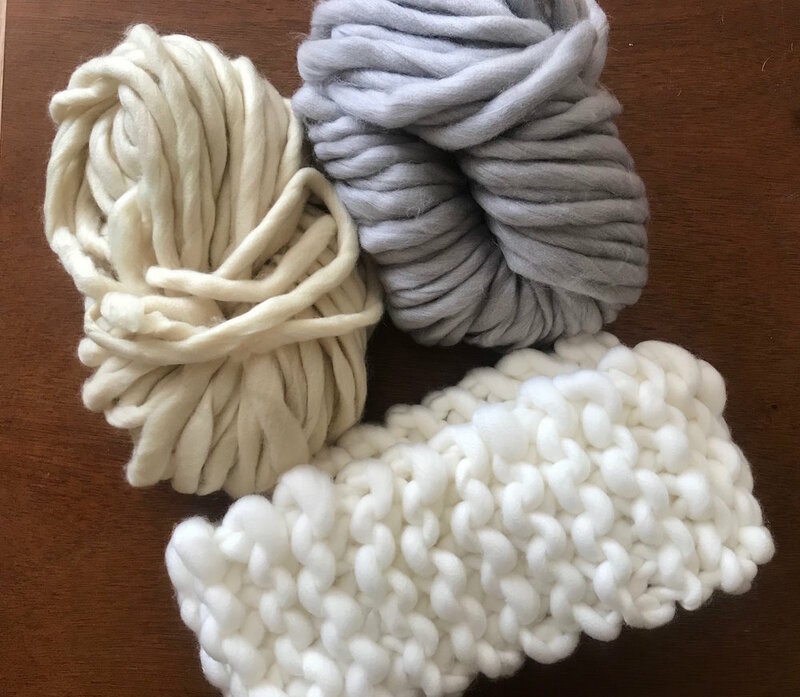 Knit and crochet designer Cara Corey will teach you how to get started knitting using soft chunky yarn and big knitting needles. You will learn a basic garter stitch, which is all you need to create a cozy scarf. You may even complete the scarf during the class. Cara will also show you how to seam the scarf so you can turn it into a cowl. All yarn from small-batch maker Coffee and Blankets and a set of knitting needles are included.